ICD's conversion of the mechanical rigs into advanced rigs can lead to higher margin in the medium-to-long term. The company's fleet size has nearly doubled to 32 marketed rigs after the Sidewinder acquisition in Q4. Muted demand for drilling services has put pricing and margin under pressure in the short term. 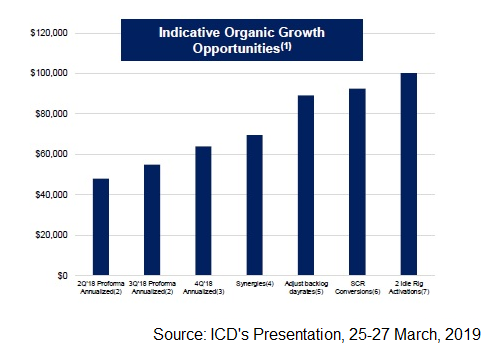 ICD's stock price has upside potential in the medium-to-long term. Independence Contract Drilling (ICD) offers onshore contract drilling services in the Permian Basin, Eagle Ford Shale, and the Haynesville Shale. I think ICD's stock price has the potential to produce strong returns in the long term. The company has undertaken a plan to convert its legacy rigs into more advanced AC rigs. As a result, the company's profitability has started to inflate from lowering operating costs. It is also building more advanced 300 Series newbuild rigs. In Q4 2018, ICD's rig fleet doubled in size following the Sidewinder Drilling acquisition. The synergies from the acquisition are expected to drive down costs and improve margin in 2019. On the other hand, the drilling business has seen a demand slowdown in the unconventional shales in the past couple of quarters, which has led to lower spot prices and shorter contract terms. These factors can lower ICD's margin and affect cash flow stability adversely in the short term. Independence Contract Drilling has grown significantly following the Sidewinder Drilling acquisition in October 2018. From operating 15 rigs, ICD's current rig fleet includes 29 AC powered rigs and three 1500hp ultra-modern SCR (or silicon-controlled rectifier) rigs following the combination. It may also convert these three SCR rigs to AC pad-optimal status. During Q4 2018, the company reactivated the 32nd operating rig in Haynesville, while renewing contracts for five rigs. It will be noteworthy to understand what happened during Q4 in the industry and how it affected ICD's plans and day rates. While the crude oil price slipped by 38%, the U.S. rig count remained steady (3% up) during Q4. New drilling activity and completions activity suffered as a result of the fall in the crude oil price. This is evidenced by the EIA's DPR data. The upstream customers reduced their 2019 E&P capex budget in the U.S. The industry pressure did catch up with ICD's recent performance. From FY2017 to FY2018, the company's rig operating days increased by 42%, while average revenue and average margin recovered by 10% and 33%, respectively. However, due to the slowdown, both these metrics deteriorated. The average revenue and average rig margin per operating day declined by 1% each from Q3 to Q4. The company has scaled down its expectation of the recovery in day rates. While it was projecting $23,000 to $24,000 as the average revenue per operating day before the price crash, it now brought it down. On the positive note, the rates in the re-contracts in Q1 may still be above the Q4-level. ICD's strategies to improve revenue per rig, apart from the improvement in day rates, would depend on higher rates on upgraded rigs and picking up pad-optimal rigs. Over the past couple of months, it was able to re-contract three operating SCR rigs in incrementally higher day rate than their expiring contracts. Also, the pad-optimal rigs because of their high usage in the horizontal drilling techniques have been seeing high utilization. 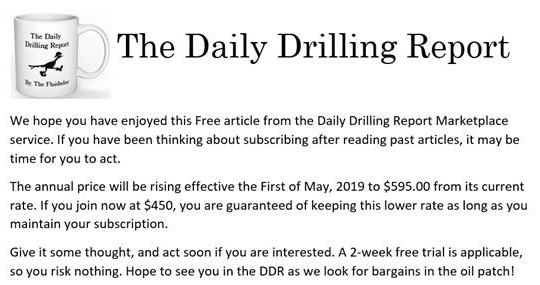 Independent Contract Drilling's management seems to be upbeat about the energy price and in the company's ability to get contracts. While it acknowledges the uncertainty surrounding the upstream operators' capex budget, the recent trend suggests a shorter contract duration. Short-duration contracts can help producers benefit from the sudden change in the spot price. Rather than reducing their contracted rig count, several operators have rolled the current levels of contracted rig count by extending contracts on shorter durations, thereby giving them the opportunity to hold on to their rigs and their hard-earned efficiencies if prices remain stable at current levels and eventually rise. ICD is likely to generate free cash flow through the oil and gas cycles. Its FCF generation ability is built on growing on based on the organic drivers as well as the drivers from the Sidewinder acquisition. It can now re-price the old legacy contracts at the leading day rate. The company is working on converting three SCR rigs to AC pad-optimal rigs. The company is also enhancing racking and hookload capacity to ICD 300 series while planning to add a third pump based on market demand. As of December 31, 2018, ICD's backlog was $120.9 million, which includes revenues from contracts with terms of six months or more. Approximately, 95% of this backlog is expected to be realized during 2019. Let us now discuss the inorganic factors that can lead to the FCF improvement. The post-combination integration will be substantially complete by the end of Q2 2019. By Q3 2019, ICD's management expects more than $10 million run rate synergies. But what are the rationales behind the company's expectations in the acquisition? Well, ICD and Sidewinder have complementary pad-optimal drilling fleets and operations focused in the Permian Basin, Haynesville region, and other basins in Texas. It appears that the benefits of the integration have already begun to reflect in lowering costs. The Q4 2018 cost per day of $12,932 was better than its past guidance. A lower cost resulted from increased economies of scale and acceleration of certain operating synergies. The SG&A costs also softened following an acceleration of certain synergies. The success for far in the Sidewinder acquisition may encourage ICD to undertake further rig addition through the M&A route. The company's management expects the contracted rig count, FCF, and EBITDA to rise as a result of a higher fleet. Given upstream customers' preference for shorter-term contracts, it does not expect to sign any new long-term (one year or more) contract. If the crude oil price firms up, the upstream customers' budget plans will stabilize and the terms of the contract may lengthen. 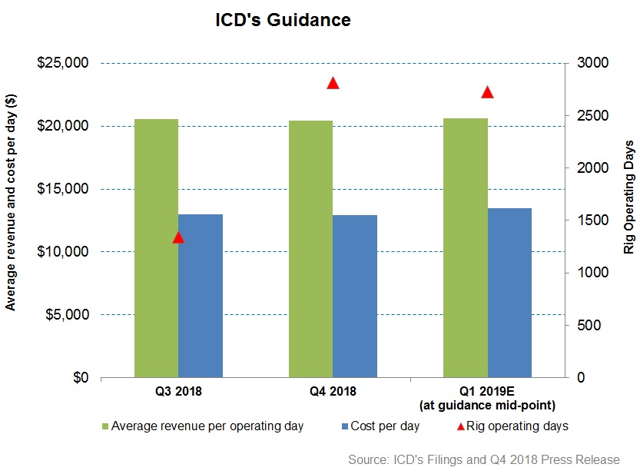 In Q1 2019, ICD's management expects rig operating days to decrease by 3% compared to Q4 2018. While average revenue per operating day is expected to improve marginally (1% up), it can be more than offset by higher cost (4% up), leading to ~5% decline in average rig margin per day. The rise in costs is related to higher seasonal payroll tax items and lower operating days in Q1. Plus, the operational synergies from the Sidewinder acquisition would negate some of the adverse effects on the company's net margin. What's ICD's Current Financial State? In conjunction with the Sidewinder acquisition, ICD issued $130 million of debt in Q4 2018, which will be due for repayment in 2023. It also entered into a $40 million revolving credit facility upon the completion of the merger transaction. The company's liquidity stood at $54 million as of December 31, 2018. Its debt-to-equity now stands at 0.28x, which is much lower than its peers' average (0.51x). Nabors Industries' (NBR) leverage is higher (1.36x) than the peer average, while Helmerich & Payne's (HP) leverage is lower (0.11x). In FY2018, ICD's cash flows from operations were $16.1 million, which was a 227% increase compared to FY2017. Not only was the rise in CFO a result of higher revenues in FY2018 (58% higher compared to FY2017), it also went up due to working capital improvement owing to lower accounts receivable and higher accounts payable. ICD's $29 million FY2019 capex plan includes $9 million in SCR upgrade, $5 million for additional equipment packages. ICD does not have any share repurchase or dividend plans shortly. Since ICD has no significant debt repayment before 2023, its balance sheet is relatively free of any near-term financials risks. However, given its low cash flows, it should keep its capex plans tight to avoid straining the balance sheet in FY2019. What Does ICD's Relative Valuation Say? 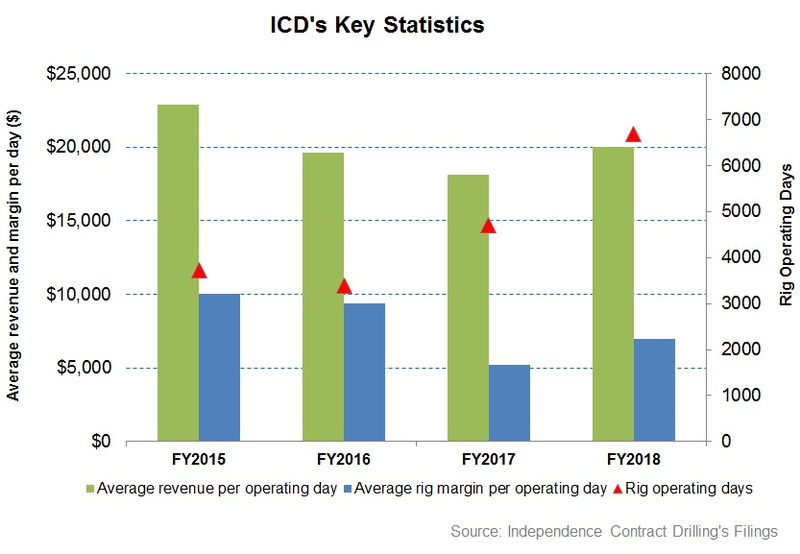 ICD is currently trading at an EV-to-adjusted EBITDA multiple of ~10.8x. Based on sell-side analysts' estimates, ICD's forward EV/EBITDA multiple compression implies higher EBITDA in the next four quarters. Between Q1 2017 and Q4 2018, its average EV/EBITDA was 23.7x. So, the company is trading at a discount to its past eight-quarter average multiple. 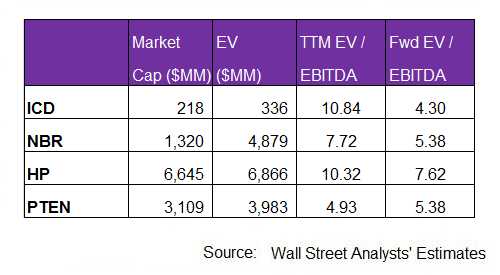 Sell-side analysts expect the company's EBITDA to increase more sharply than the rise in the peers' average in the next four quarters, which typically results in higher current EV/EBITDA multiple compared to the peers. The company's TTM EV/EBITDA multiple is higher than its peers' (NBR, HP, and PTEN) average of 7.7x. I have used estimates provided by Thomson Reuters in this analysis. According to data provided by Seeking Alpha, five sell-side analysts rated ICD a "buy" in April (includes strong buys). Two sell-side analysts rated it a "hold", while none rated a "sell". The consensus target price is $5.56, which at ICD's current price yields ~96% returns. What's The Take On ICD? Independence Contract Drilling is gradually converting its legacy rigs into more advanced AC rigs. 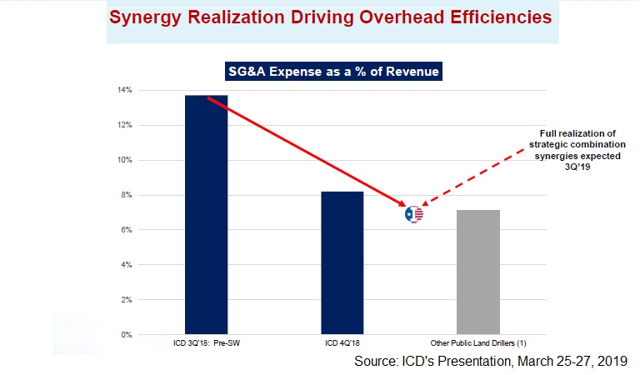 A higher mix of advanced AC rigs should help ICD's profitability by lowering operating costs in the long run. In Q4 2018, ICD's rig fleet doubled in size following the Sidewinder Drilling acquisition. The synergies from the acquisition are likely to drive down costs and improve margin in 2019. Since Q4, the drilling business has seen a demand slowdown in the unconventional shales, which has led to lower spot prices and shorter contract terms. These factors can lower ICD's margin and affect cash flow stability adversely. Despite that, the company's management expects stability in the crude oil price and upstream operators' capex budget, which can drive margin up in the latter part of 2019. It is free of any significant near-term debt repayment obligations. I think returns from ICD's stock can be robust in the long term.